Here is the Moku Hanga print. I think the printing is imperfect but it’s not bad for a first try. I have been asking printmakers advise on forums. This was written by Hannah. Posted on Tuesday, April 12, 2011, at 1:40 AM. Filed under Art. Tagged moku hanga, printmaking, woodcut. Bookmark the permalink. Follow comments here with the RSS feed. Post a comment or leave a trackback. Hi Hannah. I met you on Etsy earlier in the week and then discovered you were also on Baren Forum. 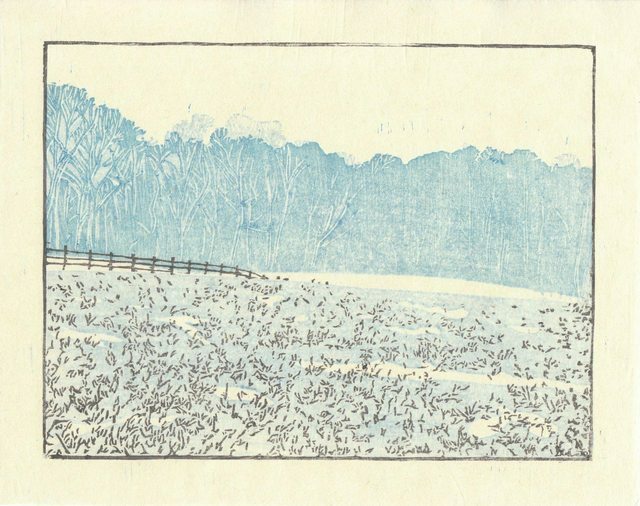 I just joined it yesterday and I just finished a moku hanga print too–mine not nearly so lovely as yours! I think your print looks fabulous. I’ve subscribed to your blog now and I will enjoy keeping up with your progress. When I become a little less shy, or when I produce something worthy, I’ll see you on Baren too. Best! I actually just joined the Baren forum yesterday! Please don’t be shy! I love to talk about printmaking and I would love to see your moku hanga! I have had some of your lovely aquatint etchings faved for ages now. You have some lovely prints on etsy. A very sweet feminine feel. I think Lucy would approve from her greener pastures.